Peanut butter lovers... this one's for YOU! Ah, Tyler Florence... he's one of those chefs that I actually *watch* on Food Network... sometimes because he's just easy-on-the-eyes, and sometimes because he's making something droolworthy like these Cold Sesame Noodles. 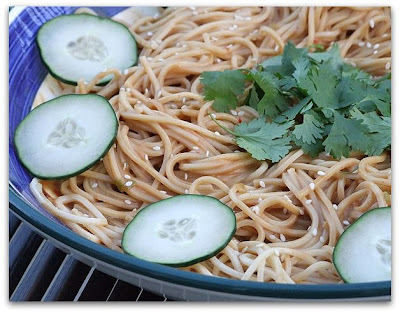 Chinese egg pasta is tossed with a peanut buttery sauce to create a creamy Asian-style noodle dish. Cool, sliced cucumbers act as a refreshing accompaniment and a welcomed bite among the rich flavors. Throw some chicken in the mix to create a main dish, or serve this up as a side to Asian Lettuce Wraps or Hoisin- Lime Marinated Chicken. This recipe comes from TF's cookbook, Tyler's Ultimate... loads of appetizing pictures and good-sounding recipes. It's a definite keeper. 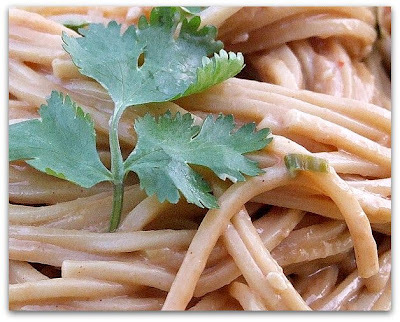 We thought these noodles were great, but I really think you have to be a peanut butter fan to enjoy this one. 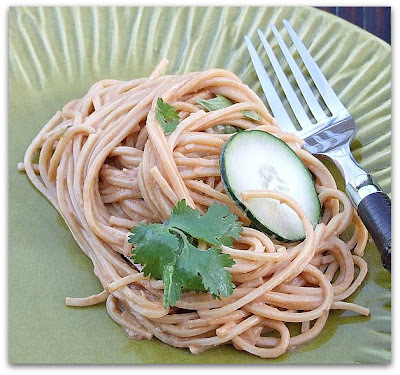 My 7 year old (an avid pb lover) renamed it, "Peanut Butter Spaghetti."